Before the 17th century Russian cuisine was quite plain and natural, without any gourmet luxuries. It was based, as a rule, on turnip and cabbage, cooked in different combinations and in all possible ways, often flavoured with spices. 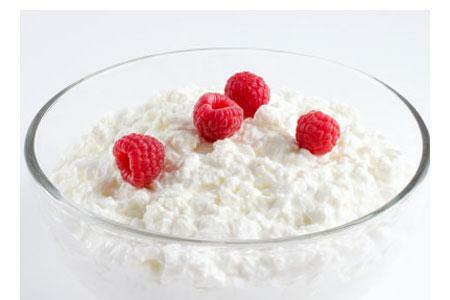 Russians also consumed all sorts of fish, as well as berries, mushrooms and numerous porridges (kasha). Fasting was an integral part of living, in accordance with the lent schedule prescribed by the Orthodox Church. About 216 days a year it was improper to eat meat and milk products. Instead there was an abundance of fish dishes (fish was cooked, baked, dried, smoked, salted and fried) and dozens of grades of caviar, not to mention vegetables and cereals. Unfortunately, not so many records of exact recipes of ancient and medieval dishes of the Russian cuisine have come down to us. The first known cook book in Russian history dates back to 1547, but it has only enumeration of dishes, without disclosure of components or a way of preparation. The majority of records still remain unresolved by modern researchers. However, some recipes seem to be unfading: Russian pancakes (bliny), porridges (kasha), stuffed pies (pirogi), spice cakes and rye bread (black bread), the recipes of which almost have not changed throughout centuries. The 17th century brought the Tatar dishes to the table of common Russians. It was one of the consequences of the Russian conquest of Kazan and Astrakhan, as well as taking Bashkiria and a part of Siberia. This is when the well-known Russian meat dumplings (pelmeni) and noodles came to be. Besides, the nation developed a habit of tea-drinking to such an extent that today it can be considered a national drink, rather than vodka. Besides, a variety of spices was imported to Russia in the 17th century and added tons of bakery food recipes. Besides, there was time when "Korean style” grated carrot and grated black radish with pepper were devised. The nobility also ate all kinds of fish and game. Hunting was very popular among the nobility; birds and animals were cooked as a whole. Sometimes dishes were so huge that three or four servants were required to bring them in a dining room. The dinner could last up to eight hours… as dishes went on arriving! The cuisine fashion was sharply changed in the 18th century. It became fashionable among Russian aristocracy to employ foreign cooks, mainly from France. Russian cuisine derives its rich and varied character from the vast and multi-cultural expanse of Russia. Its foundations were laid by the peasant food of the rural population in an often harsh climate, with a combination of plentiful fish, poultry, game, mushrooms, berries, and honey. Crops of rye, wheat, barley, and millet provided the ingredients for a plethora of breads, pancakes, cereals, kvass, beer, and vodka. Soups and stews full of flavor are centered on seasonal or storable produce, fish, and meats. This wholly native food remained the staple for the vast majority of Russians well into the 20th century. Soups have always played an important role in the Russian meal. The traditional staple of soups such as shchi, ukha, rassolnik, solyanka, botvinya, okroshka, and tyurya was enlarged in the 18th to 20th centuries by both European and Central Asian staples like clear soups, pureed soups, stews, and many others. Russian soups can be divided into at least seven large groups: Chilled soups based on kvass, such as tyurya, okroshka, and botvinya. Light soups and stews based on water and vegetables. Noodle soups with meat, mushrooms, and milk. Soups based on cabbage, most prominently shchi. Thick soups based on meat broth, with a salty-sour base like rassolnik and solyanka. Fish soups such as ukha. Grain- and vegetable-based soups. Soups have always played an important role in the Russian meal. The traditional staple of soups such as shchi, ukha, rassolnik, Soyinka, botvinya, okroshka, and tyurya was enlarged in the 18th to 20th centuries by both European and Central Asian staples like clear soups,pureed soups, stews, and many others. Russian soups can be divided into at least seven large groups: § Chilled soups based on kvass, such as tyurya, okroshka, and botvinya. § Light soups and stews based on water and vegetables. § Noodle soups with meat, mushrooms, and milk. § Soups based on cabbage, most prominently shchi. § Thick soups based on meat broth, with a salty-sour base like rassolnik and solyanka. § Fish soups such as ukha. § Grain- and vegetable-based soups. Okroshka is a cold soup based on kvass or, less often, sour milk. The main ingredients of both types are vegetables that can be mixed with cold boiled meat or fish in a 1:1 proportion . Thus vegetable, meat, and fish varieties of okroshka are made. There must be two sorts of vegetables in okroshka. The first must have a neutral taste, such as boiled potatoes, turnips, rutabagas, carrots, or fresh cucumbers. The second must be spicy, consisting of mainly green onion as well as other herbs—greens of dill, parsley, chervil, celery, or tarragon. Different meat and poultry can be used in the same soup. The most common ingredient is beef alone or with poultry. If it is made with fish, the best choice would be tench, European perch, pike-perch, cod, or other neutral-tasting fish. The kvass most commonly used in cooking is white okroshka kvass, which is much more sour than drinking kvass. Spices used include mustard, black pepper and pickled cucumber (specifically, the liquid from the pickles), solely or in combination. For the final touch, boiled eggs and smetana (a heavy sour cream, similar to crème fraîche) are added. Botvinya is a cold soup based on sour kvass and broth of beet leaves and roots. Rassolnik is a hot soup in a salty-sour cucumber base. This dish formed in Russian cuisine quite late—only in the 19th century. About this time the name rassolnik was attached to it, originating from the Russian word "rassol" which means brine (pickle water). Pickle water was known to be used as base for soups from the 15th century at the latest. Its concentration and ratio with other liquids and soup components gave birth to different soups: solyanka, pohmelka, and of course rassolnik. The latest are moderately sour-salty soups on pickled cucumber base. Some are vegetarian, but more often with products like veal or beef kidneys or all poultry giblets (stomach, liver, heart, neck, feet). For best taste there has to be a balance between the sour part and neutral absorbers (cereals, potatoes, root vegetables). Typical rassolnik is based on kidneys, brine (and pickles), vegetables and barley. Tyurya is very similar to okroshka, the main difference being that instead of vegetables, bread is soaked in kvass. It is rather historical meal, that was consumed during rough times (WWII, WWI, Revolution) and by poor peasants. Also, due to its simplicity, it was very common as a meal during religious fasting. Sbitenis a traditional Russian folk drink made of honey, overseas spices, and fragrant curative herbs. Commonly used plants are ginger, pepper, bay leaf, cinnamon, cloves, cardamom, nutmeg, tutsan, sage, all-heal, and other herbs rich in taste and healing properties. There are Simple Herbal Sbiten, Winter Sbiten , Stavropol Alcoholic Sbiten. Kozuli.Originally kozuli were a folk delicacy of Pomory ("coast-dwellers” - inhabitant of White Sea and Barents Sea coast), who made them only for Christmas. Presently kozuly are made in the Arkhangelsk Region and Murmansk Region, and the Urals. Kozuli are also considered to be a version of spice-cakes. Kozuli can also be used as toys – children like playing with them before eating. 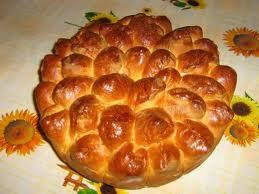 Russian Karavai – the traditional round bread loaf - has come down to us from ancient pagan times. Karavai was a must at the Russian wedding feast, with numerous ritual rules observed during its preparation. Wedding loaves are decorated with complicated pastry designs and branches of arrow-wood, which is believed to have mystical properties and is a symbol of love. A variety of salads are a must on a festive Russian table: the most typical are the Russian salad, beetroot salad (vinaigrette), herring salad, etc. Before cooking of salads the ingredients are cooled down. Hot snacks are comparatively rare: the best of them moved to the category of second courses. An exception is boiled potato. Meanwhile hot snacks are the best snacks to strong drinks. Porridge is undoubtedly a primordially Russian dish. Moreover, porridge is a cult dish. Following old Russian traditions, on wedding ceremony the groom and the bride necessarily cooked porridge. It is evidently this tradition that brought about the saying: "One cannot possibly cook porridge with him/her”. Even entire history of the Russian state is inseparably linked with porridge. So, Russian porridge can be justly called the most important dish of the national Russian cuisine. Porridge was cooked for numerous events. In ancient Russian chronicles feasts are often referred to as "kasha”: for example on the wedding of Alexander of Macedonia "porridge was made up" twice – first time at the wedding in Troitsa and the second one during national merrymaking in Novgorod. Porridge was necessarily cooked on the occasion of starting an important undertaking. Hence is the expression "zavarit’ kashu” literally translated as "to boil up kasha” and meaning "stir up trouble". Porridge in Russia could even describe human relations. Thus, the saying "One cannot possibly boil kasha with him/her” is applied to an unreliable and incompliant person. Apart from cereal and pea porridges, the Russians cooked fish and vegetable porridges. There is also the famous Suvorov’s porridge. Salted cabbage (kvashennaya kapusta)– another vodka snack: the pickled cabbage is being kept in the jar for the several days.with berries, salt and spices. Herring in sheepskin coat (seledka pod shuboy) – small pieces of the herring mixed with the boiled potato, beet, carrot and mayonnaise. 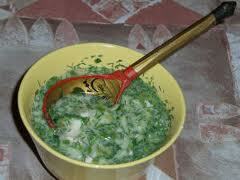 Fresh vegetables (svejie ovoshy) – the salad made of cucumbers, tomatoes and onions. Usually made with vinegar or oil. Salmon caviar (ykra) – red or black. Traditional Russian appetizer. Black one is far more expensive. Usually served on ice. Russians prefer to eat toasts with butter and caviar. Medley (vinegret) - pieces of herring, chopped beet, cucumber, carrot, potato and oil. One of the few vegetarian salads in national cuisine. Boiled beef tongue (yazyk) – slices of the tongue, served with horseradish. http://www.waytorussia.net/WhatIsRussia/RussianFood/Appetizers.html Main courses are eaten at the dinner (afternoon meal) and at the supper (evening meal). Most often they include meat (beef, chicken, fish) or vegetables and are served with various garnishes and dressings. Garnishes are usually always eaten with a main course (vegetables or meat) and are served both at dinner and supper. Quite often garnishes are served with different sauces, like mustard and khren. Baked potato - there's a nice fast-food chain in Moscow, called "Kroshka-Kartoshka", they cook nice baked potatoes. Buckwheat (grechka) - our favourite garnish, unfortunately it doesn't grow in Europe, because of its strange taste, but it's really nice. Syrniki - can also be called "tvorog burgers" because they are made of tvorog and fried on a sauce-pan after. Usually eaten with honey, sweet dressings, or jam.